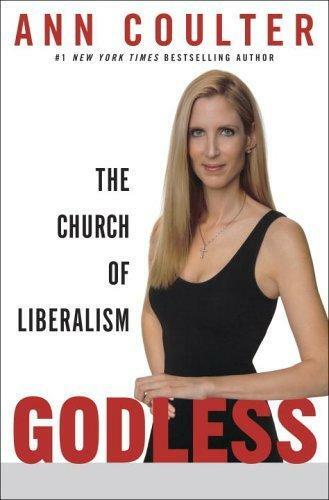 I was in Barnes and Noble the other day, and from a distance, I saw the cover of Ann Coulter’s newest book, Godless. I don’t have a lot of love for Coulter, but I know she or the people packaging her, are very good – they sell grandstanding and posturing in a way that they could never sell reasoned or sensible. She says the most egregious, obviously idiotic and unthinkable things and it sells, because she says the unreasonable things a certain segment of the population wishes they could say, and which another (hopefully larger) segment of the population finds compellingly repellent. So, I ask you, how the hell did she come up with the cover for this book? From a distance, all you see is “Ann Coulter [scribble scribble]” and a photo of Miss Coulter herself leaning on what appears to be a nice big label. Maybe she needs new image management. Maybe it’s intentional – maybe they’re playing up her negative reputation among the thinking masses. Or maybe, just maybe, it’s proof that the media package that is Ann Coulter is sheer parody. Imagine it. Could it be, I wonder, that Ann Coulter is a liberal satirist who has been trapped in the hell of having her lampoon of the worst of the other camp be taken seriously, and worse, turn lucrative? Surely you can sometimes see the glint of sadness in her eyes through the books signings and talk show appearances — a glimmer of repentance, perhaps? Or a plea for escape? Then again, maybe she just is the worst of that camp and in these day and age, public opinion has given her the bullhorn. Maybe she’s just her own parody. Posted by aprotim on Tuesday, July 25th, 2006, at 5:14 pm, and filed under Media-tion, The Substance of Things. To quote Napolean Dynamite, mayve your just a “friggin idiot.” Stop your liberal spewww. You eat too much CNN for breakfast. Your right. Ann is a democrat. The best of jokes. If you get her drunk she talks about it. It’s all about the money. Read the book in two hours. It was that light and it almost floated away. No need to even counter her arguments as she does it perfectly for herself. Recommend this book to your enemies as the cure to liberalism. They will be confused for years. or as Ann would say con-fused.